HK is primarily a world of high end makeup, and these brands become our go to for makeup brushes. MAC & Bobbi Brown lead the way and cheaper brushes are not available. Well they are, like those available at SASA or Bonjour but they are about as soft as dish scrubbers. Its only through my beauty vlogger addiction that I found out about the Real Technique brushes by Sam Chapman. And those I ordered off iHerb, including the awesome Miracle Sponge. Through Youtube I also learnt of E.L.F & Sonia Kashuk and some of their pretty awesome brushes. Note the use of the word ‘some’. Anyway I do adore all my RT brushes and my E.L.F kabuki brush is simply marvelous, but my search for local (cheaper) brushes continues since shipping costs from the US do add up. After numerous duds purchased (dish scrubbers) I am very happy to announce that Sasa’s own brand Sasatinnie has made me and my wallet very happy. They are soft and blend well. The Foundation brush- I use this to apply serum and my face-mask. I am a Sponge (or fingers) foundation girl so I don’t use it for foundation. The small white brush- I use it to lightly dust powder on my face, especially under my eyes. I am sure it’s for blush. A nice small size. We know that its almost impossible to find small blush brushes! 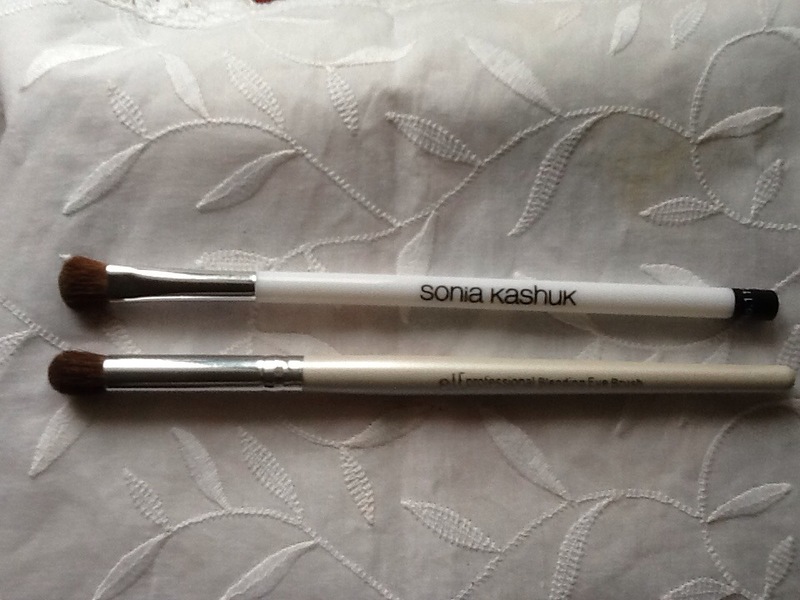 The Angled Eye brush- is beautifully soft and blends well. Its a bit too big for my small eyes as I have very little lid space. Just for reference even the MAC 217 is a bit too big for my eye space and the hunt for the perfectly sized crease/eye blending brush continues.